Helped by low voter turn-out (44%), governing Fidesz party swept municipal elections in Hungary on Sunday. In Budapest only 40 percent of qualified voters went to the polls on Sunday. 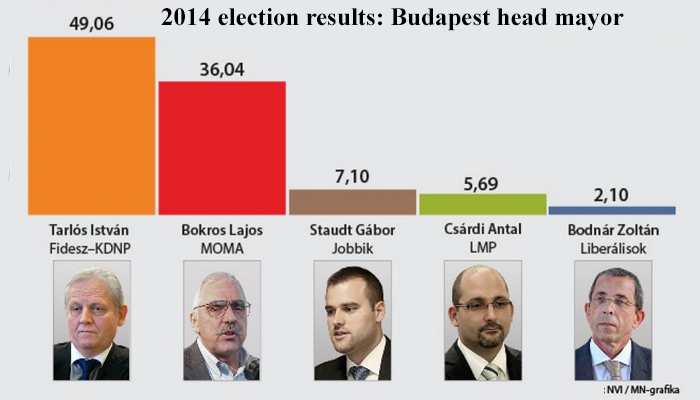 Budapest’s incumbent head mayor, Istvan Tarlós (Fidesz-KDNP), was re-elected with just over 49% of the popular vote. His main challenger, Lajos Bokros (MOMA), came in a distant second with just over 36% — a strong performance considering he emerged as the main opposition candidate only ten days before the election and did not enjoy the unequivocal backing of the Hungarian Socialist Party or Dialogue for Hungary (PM). Despite Jobbik posting major gains in the countryside, its candidate for Budapest mayor, Gábor Staudt, fell somewhat short of expectations, garnering just over 7% (Jobbik was polling in double digits a week before the election). LMP candidate Antal Csárdi performed more or less as expected. Liberal candidate Zoltán Bodnár managed to receive just over 2%. 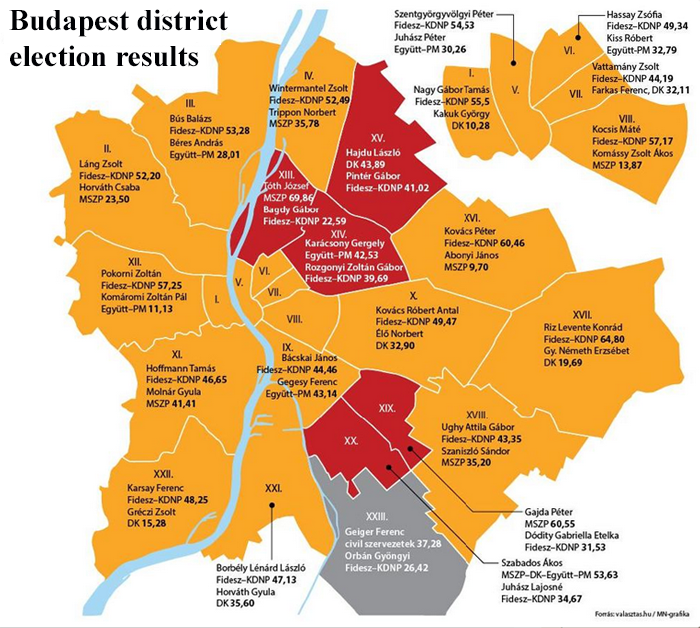 Opposition and independent candidates for district mayor won six out of Budapest’s 23 districts, failing to win back such traditional left-wing strongholds as Csepel, Ferencváros and Új Buda. Because the law governing Budapest elections was recently modified by parliament so that district mayors automatically serve on the Budapest city council, that body will feature a large Fidesz-KDNP majority. In the Hungarian countryside Sálgotarján and Békéscsaba joined Szeged as the only major provincial cities not to elect Fidesz mayors. In Szeged, incumbent László Botka easily defeated his Fidesz opponent, János Kothencz , despite Fidesz and various Fidesz Political Action Committees in the guise of civil organizations spending record sums on the latter’s campaign. In the south-eastern city of Békéscsaba Péter Szarvas became the first independent candidate be be elected mayor of a major provincial city thanks in part to support from Jobbik, receiving just under 42 percent of the vote. 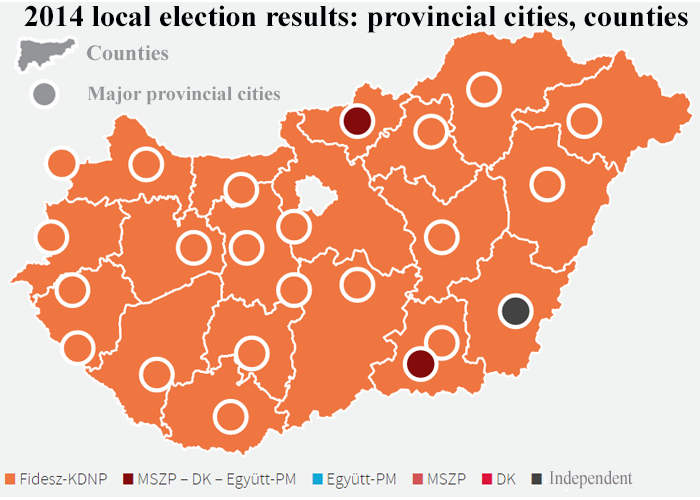 Fidesz candidates swept the counties, as well as vast majority of provincial cities, towns and villages, although there were some upsets. In the western resort town of Siofok, independent candidate for mayor Róbert Lengyel defeated incumbent Árpád Balázs (Fidesz-KDNP). In Devecser, site of the 2010 red sludge disaster, Jobbik candidate Gábor Ferenczi defeated the sitting mayor Tamás Toldi (Fidesz-KDNP). In the northern industrial city of Ózd, Jobbik candidate Dávid Janiczák defeated incumbant Pál Fürjes (FIdesz-KDNP). It is not known whether the following video helped or hindered the Jobbik candidate’s campaign. Jobbik mayor candidates also won in Tapolca, Törökszentmiklós, Hegyháthodász, Recsk, Kosd, Ásotthalom, Mátraballa, Gasztony, Monorierdő and Bánokszentgyörgy. The Jobbik mayors of Tiszavasvár and Hencida were reelected. In all but three counties–Csongrád, Baranya és Veszprém–Jobbik candidates came in second after Fidesz candidates.